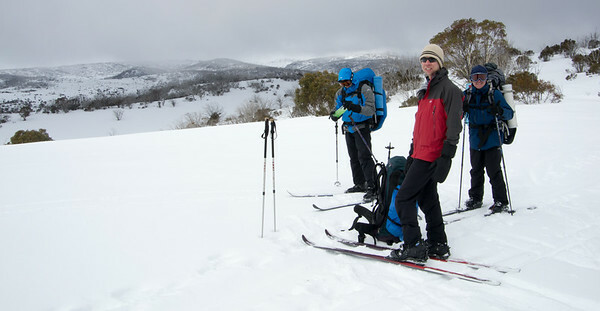 Kiandra to Kosciuszko is Australia’s classic long-distance ski tour, dating back to around 1927 when the route was first completed by Schlink. More realistically it is Australia’s only long distance winter tour, with walking at least part of the way a likely requirement. When planning our trip in 2014, we were surprised at the lack of consolidated information online. This page brings together some of what we learned along the way, with thanks particularly to Tracey-Ann who did much of our pre-trip planning. 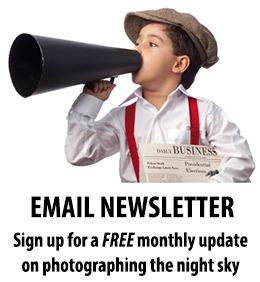 Download our full August 2014 Kiandra to Guthega ski route here: K2K Google Earth KML. This file includes separate paths for each day plus one consolidated path for the whole nine days allowing you to see overall elevation profile and route statistics at the day or whole trip level. When planning our K2K route, we looked at the maps and the long winding route taken by the various roads and trails and thought that in winter straighter routes across snow-covered alpine areas would be shorter and faster. This was certainly influenced by our experience of Victorian back-country skiing, like the wide open Bogong High Plains at similar elevations. In practice the winding trails proved to be faster with trees and other vegetation and steep slopes blocking many straighter routes and the time saved on navigating and route finding on the trails more than making up for their extra length. 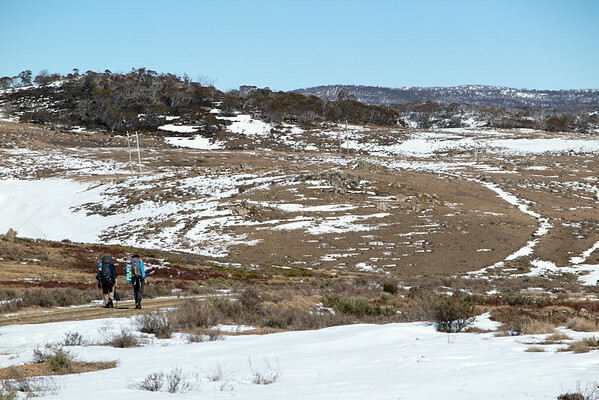 From Mount Jagungal and Cessjacks Hut to Mawson’s Hut and the Kerries there is generally wide open snow-covered terrain where direct routes are possible although it wouldn’t be much fun in poor weather conditions. The northern parts from Kiandra to Happy’s and Brooks Huts have substantial tree cover so the trails provide logical routes. Kiandra on the Snowy Mountains Highway is the obvious starting point for a K2K trip, but the snow at 1400m elevation here is often marginal. It is possible to start at the Selywn Snowfields and work your way up the slopes with snow making cover to gain higher ground. 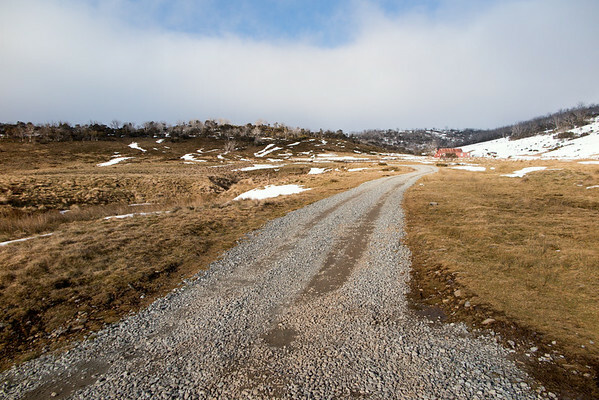 Alternative access to the Jagungal Wilderness Area can be gained by heading up the Round Mountain Trail to Dercshko’s Hut (see Transport from Corryong below). The biggest obstacle to an enjoyable K2K ski tour is the Happy Jacks Plain. This is a large expanse of low lying terrain which seems to not attract snow when it does fall and loses it fast when the sun shines or the rain comes down. As a result there is a large area that often requires walking. One option is along Happy Jacks Rd and Grey Mare Firetrail from Happy’s Hut picking up snow when the Grey Mare trail gets high enough on the way towards Mackays Hut (or Cessjacks). The alternative to the winding Happy Jacks Rd is to come down Arsenic Ridge towards Brooks Hut, and from there cross Happy Jacks River at the somewhat dicey log bridge. We had read about Arsenic Ridge and some horror stories about getting stuck bashing through snowgum regrowth and poor snow. However, we did read one group that had managed it without much apparent difficulty so with good snow cover we decided to give it a shot even knowing that we had started the day late and could be finishing in moonlight. We left the Bolton's Hill Trail about 1km west of the junction with the Tabletop Trail. We had put in waypoints at knolls along the ridge (marked as survey points on the 1:25,000 maps). The first two we picked up with not too much difficulty. From there (at a saddle just below 1600m) we made the mistake of following tracks down on a traverse rather than going up and over the next peak on the ridge (turns out they weren’t human tracks). That decision quickly lead us into fairly impenetrable snowgums. Eventually we made our way back up to the highest points on the ridge and from there were able to make our way steadily down the ridge, round some steep rocky knolls. With moonlight taking over, by the time we got to the last saddle at below 1550m, we decided to follow the GPS on a direct line through the final 500m to Brooks Hut, which was a fairly awkward bash through trees. A better route would have been to drop below the treeline onto the plains and work around and then just slightly up to the hut. It may also have been ok to continue following the ridge until directly above the hut. If you load our GPS track (above) you can closely follow our route down Arsenic Ridge and see where we hit trees and that there are enough open areas as alternatives, generally by staying high on the ridge. We did have good snow cover which at least made things easier. If you were carrying skis on your pack this would be much less fun. The following day from Brooks Hut, we made our way 2km along Happy Jacks Rd and then climbed up a ridge picking up snow well before we reached the Grey Mare Trail at Grid Ref 55H 0636313 6005945. If you haven’t already visited Mt Jagungal in the winter, then climbing this impressive mountain in fine weather should probably be your primary goal for a first trip in this area. It can be climbed as a day trip from O’Keefe’s or Cessjacks Huts without heavy packs. Our day trip from O’Keefes was certainly the highlight of our nine day expedition. An alternative route is to leave Grey Mare Trail before you get to Mackays Hut and head direct to Cessjacks Hut. Mount Jagungal can be climbed also as a day trip from there. From Cessjacks you can take the high and open route to Mawsons Hut - something I would like to try next time. Farm track through private land, one possible route to Cessjack's Hut? The ‘main range’ from Consett-Stephen Pass at the southern end of the Rolling Grounds to Mt Kosciuszko maintains high elevation with a series of peaks well over 2000m. The exposure would make gentle breezes in the valleys seem like bitterly cold storm winds up high. 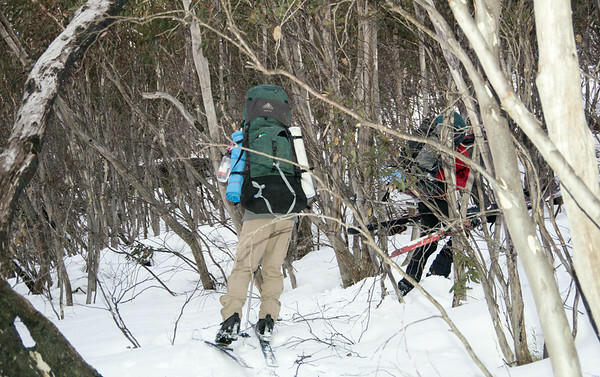 While mostly not very steep along the ridge, snow cover is highly variable with many icy sections making for challenging travel, especially with a pack. It would be prudent to have explored this area on shorter trips before attempting to finish a K2K expedition including camping through here. In planning our trip, we read a lot about the need to cross Happy Jacks River, either via Happy Jacks Rd or the log bridge south of Brooks Hut. What we had not anticipated until on the trip, was the number of possible uncovered stream crossings between Mackays, O'Keefe's, Grey Mare and Valentines Hut. Knee deep Doubtful Creek was our first wet crossing, followed by ankle deep Bogong Creek before the final climb to O'Keefe's Hut. 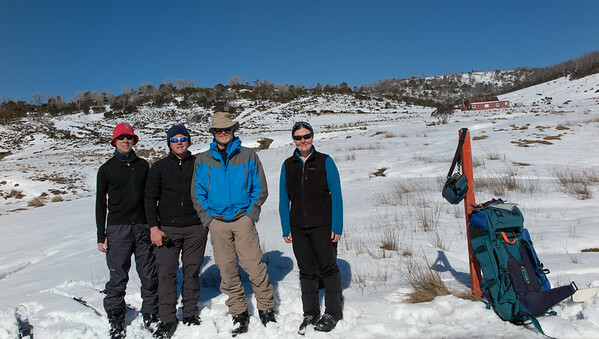 From O'Keefe's to Grey Mare Hut, we were able to step easily over grass/snow across the Tumut River on Grey Mare Trail. With judicious placement of a few stepping stones I was able to walk across the Tooma without removing my ski boots, but others in the group still got out the water shoes. Between Grey Mare and Valentine’s Hut there are four potential stream crossings. Back Flat Creek and its tributaries below Grey Mare Hut present various crossing combinations. We cut it down to one wet feet crossing, which I was also just able to do hopping across grass and more stepping stones placed for the purpose at the junction between the two Back Flat Streams (Grid Ref 55 H 0621908 5991101) crossing first to the point in the middle of the junction using the clumps of grass and then using stones over the second part (below). The Geehi River is about halfway between Grey Mare and Valentines Hut and is the most substantial river crossing we encountered. We had to wide across ten metres of bitterly cold water above knee high depth. The weather was cold and windy the day we did but thankfully there is a hefty climb up afterwards to warm the toes up. Grey Mare Trail also crosses the Valentine River just a little below Valentines Hut, at which point a serious wet feet crossing is required (with high snow banks on the side). We fortunately followed trails of others we had met O’Keefe’s Hut. Their tracks left Grey Mare Trail 1km from the hut heading up over a ridge then down a nice ski slope where we were able to cross delicately over rocks and ice ledges (Grid Ref 55H 0623864, 5990397). That left one tricky crossing of a smaller tributary just before reaching Valentines Hut. At this final stream crossing, the hazards were also made obvious. Ski tracks traversing the steep slope immediately above the stream ended with a large bump and slide down off a bank and onto a rock and pool in the creek. 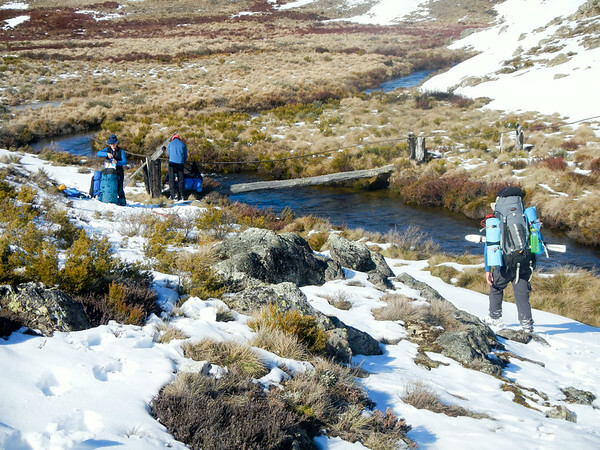 There is one final open stream between Valentines and Schlink Hut but there is a grate that provides a safe crossing point (Grid Ref 55 H 0623800 5986709). Even the high route from Jagungal Saddle or Cessjacks Hut to Mawsons Hut requires an open crossing of the Geehi River (maybe snowed over in very good snow conditions) and possibly one or two others. Sponar’s Chalet, formerly known as the Kosciuszko Hotel, at Diggers Rest (the junction between the Perisher Valley and Guthega Rd), was the traditional finish of a Kiandra to Kosciuszko expedition. With a lot of rough and low elevation terrain surrounding it, this is no longer an attractive option. The shortest finish now is to come out from White’s River Hut to Guthega Power Station. You’ll pass Sponar’s Chalet on the drive out from there. 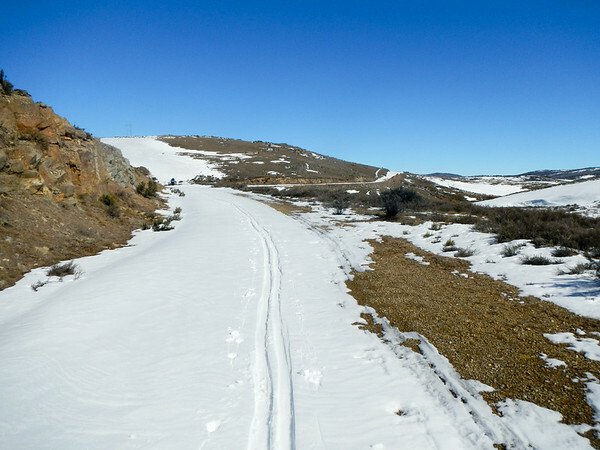 More ambitious routes, which require fine conditions to head up on the main range, could bring you out at Charlotte Pass or via Mt Kosciuszko itself to Thredbo (or even down to Dead Horse Gap). The Jagungal Wilderness Area in the middle of a K2K expedition is the most remote snow-covered alpine terrain you will find in Australia. From O’Keefe’s Hut it is potentially a three day ski out in any direction. 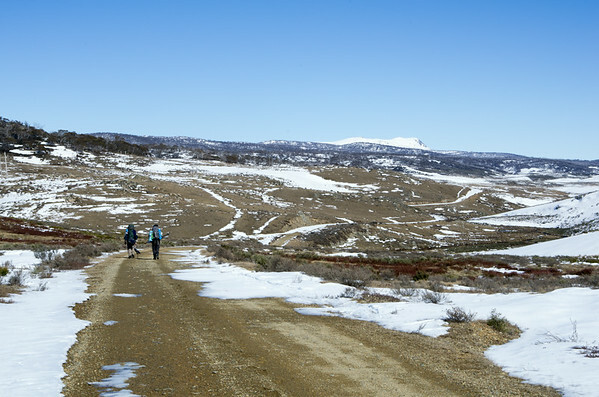 Early on, escape routes are back to the start at Kiandra or Selwyn, or perhaps down the Four Mile Trail to Sawyer’s Hut on the Snowy Mountains Highway. Once beyond O’Keefe’s you are pretty committed to coming out at Guthega Power Station if not heading up onto the main range. The only alternative in the northern end would be to head down to the Khanchoban-Cabramurra Rd (closed in winter) and hope that you can arrange a pickup by snow-mobile or such from Cabramurra. There are an impressive number of huts right through the Jagungal Wilderness Area. While many have been replaced after bush or hut fires, they all provide great places to camp for the night and get communal shelter for dinner and the evening. The Kosciuszko Huts Association (KHA) maintains the huts. Their website provides information about all of them. Our group made a substantial donation to KHA after their trip by way of thanks for these great shelters. The only minor surprise we found was that Brooks Hut did not seem to have a toilet (that we could find). Otherwise we were impressed with the size and quality of the huts. For the huts in the Jagungal Wilderness Area, we were only the 2nd or 3rd party in the huts for the winter, although we expected more groups to come after us later in August. John at Alpine Express in Jindabyne dropped our group of four off at Kiandra and picked us up again at Guthega. This was certainly an effective option for our group. Snowlink (Anne and Wally) and other companies also provide similar services. Another interesting option that we heard about was Bob the taxi driver in Corryong who can drop you off on the Khanchoban-Cabramurra Rd (with sandwiches apparently) and get you up to the snow level around the Round Mountain Trail with a relatively easy ski in to Derschkos Hut. We carried food for eight nights (nine days), which later in the trip we planned to stretch out to nine nights. I was carrying over 900g of food per day, with an energy content of around 17,000kJ. All evening meals were dehydrated and I incorporated a lot of nuts into the mix to keep the energy density (kJ/100g) as high as possible. In hindsight about 10-15% less would have been ok.
180g combination of cereal plus nut/seed mix and full fat milk powder (more energy dense than skim milk powder and likely better for you). 150g combination of dry biscuits, peanut butter, cheese and salami. Nut mix and chocolate covered macadamias, almonds with a few lollies. Oat Bars and 180 Nutrition Bars (a good source of healthy nuts/seeds). 100-140g Dehydrated meal from Strive Foods in Tasmania. Serve of soup mix and/or hot chocolate. I also carried some desserts (Strive Fruit/Custard crumble) but would skip this in future as I rarely had the desire for more food after dinner. We were using iso-butane/propane gas stoves. Between us we used the equivalent of about four standard 300g cans over the trip. They contain about 230g of gas which works out at about 30g per person per day. We weren’t drinking copious amounts of tea/coffee and only had to melt snow for water on one night. We heard differing views on the need to treat water. Most people had been drinking water from the streams without treating it (often for years) and had not reported any issues. However we did hear one account of someone’s partner or friend getting giardia that was attributed to drinking water from the streams. (One of our group did have stomach complaints afterwards, but it could have been from Vietnam where he was immediately prior to our trip - the rest of us felt fine). We drank water from the streams from Kiandra south and only treated water picked up from near the more heavily visited Schlink Hilton and Whites River Hut where human waste could be more prevalent. Others attributed water quality issues to wild pigs which could have been an issue anywhere on the route. I would treat water picked up anywhere along the main range which is heavily used in summer and contaminated by human waste with no toilet facilities anywhere in that area. For short-term forecasts, those from the Australian Bureau of Meteorology are your most reliable source. You can get four day forecasts for the Snowy Mountains region or 7-day spot forecasts for Cabramurra and Thredbo Top Station. If you can interpret pressure charts, it's well worth a look at the European model via the European Center for Medium-Range Weather Forecasts (ECMWF). This can be supported by accessing spot forecasts for locations such as Cabramurra and Back Perisher Mountain from YR.NO which is the only site I know of that gives European Model forecasts for Australian locations (although the Australian BoM also incorporates the European model as one possible input to its long range forecasts). Another good source of descriptive forecast information is the Snow and Ski Forecast from Weatherzone. This is easy to access via the Weatherzon App while you're out which is helpful. I presume this is based mainly on the U.S. GFS model, but there are often comments about when the models are not in agreement. Either way be very careful reading much into the forecast beyond 4-5 days. Just cause it describes a forecast for 14 days doesn't mean it's right! Another good source of descriptive snow forecast information is Jane's Weather, but the update frequency is sporadic. There had been a big cold dump to start the season at the end of June, followed by another good cold fall. 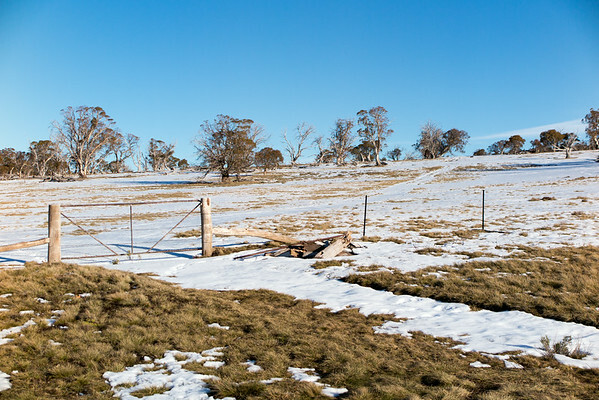 In the week before we started there was a day of rain followed by a smaller fall of cold snow to very low levels (widespread snow to low levels in Victoria, but not large accumulations in NSW). In hindsight, that warm rain would have hammered the snow on Happy Jacks Plain and it then apparently missed out on accumulating much from the snow that followed, even though Selwyn/Kiandra apparently did ok. When we left Melbourne we thought Three Mile Dam had 40cm, which was more than at any time during the previous six years or so. 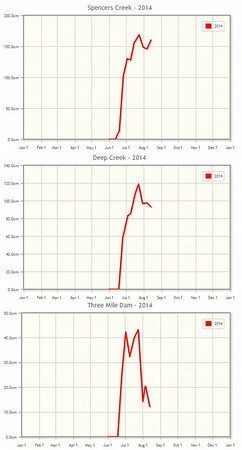 But what we didn't realise until seeing the later updates is that Three Mile Dam was only around 20cm which is more typical for the peak of a decent season (though the timing is highly variable). If you can time your trip well after a good cold dump (that delivers good falls to the northern parts of the ranges) then you may get better coverage on Happy Jacks Plain than we did. I created a rough grid referenced copy of the Telstra mobile reception maps before our trip in August 2014. 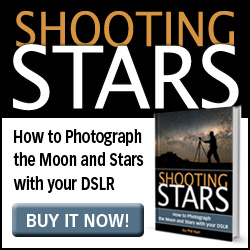 It may still be helpful although it will get progressively out of date. The letters marked should be easy to correlate with hut names and J for Jagungal etc. There was no coverage at Kiandra on the south side of the highway but you may get coverage at the courthouse just up the road. We had Telstra reception at Broken Dam Hut and O’Keefe’s Hut. We also got reception on the top of the hill behind Grey Mare Hut and patchy coverage at Whites River Hut and on the south side of Schlink Pass. Coverage was also reported on the high section of the road between Derschkos and Grey Mare hut. The only time we had Optus/Vodafone coverage was around Schlink Pass and Whites River Hut. We carried a Spot Messenger and used that to ‘Check-In’ three times per day and had it in tracking mode each day so people at home could follow our progress (location transmitted each ten minutes). One set of AAA Lithium Batteries lasted the whole nine days. We were carrying two Garmin Vista Hcx GPS units with OzTopo maps loaded. They showed the fire trails through the whole area which made following them easy even where they became indistinct under snow in open areas. Hut positions marked on the OzTopo maps were considerably out from true locations (>100m). Coordinates for huts from the KHA website seemed correct. A set of AA Lithium batteries lasted 5.5 days, although the battery status showed as very low anytime the GPS was used at night in cold conditions for planning. There is also the Spatial Vision 1:50k Kosciuszko Alpine Area Map which is good for planning but excludes the northern part of the K2K route. There is a Rooftop's Kosciuszko National Park Forest Activities Map Jindabyne-Khancoban, also 1:50k. It covers the whole route and has a plethora of large text notes across the map, some useful, some out-of-date. I can vouch for Bob Wilko from Corryong! Have used him a few times to get into the Round Mountain area.